Choose a reduced price removable or standard altimeter bay upgrade. Note, the reduced price altimeter bay upgrade does not include a couple parts that are redundant with the parts included in the kit. Fiberglass nose cone is hand laid fiberglass with white gel-coat. Includes plywood bulkplate for eyebolt attachment point. 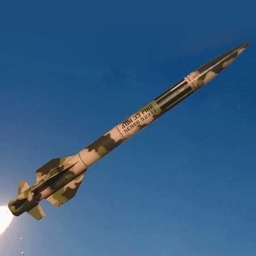 The AGM 33 Pike is a fantasy scale surface to air missile. This means there is not a real AGM 33 Pike - we just thought it would be fun to make one up. I used the 4" AGM-33 Pike for my L2 cert flight. I built it with redundant DD and flew it on an AT J420. Fantastic flight to 3100 ft that landed 50 yards from the pad. Loved the rocket. It got lost in freak lighting conditions late in the year. I got a second Pike and built almost like the first, and it too is a fantastic rocket, the pride of my fleet. Unbelievably nice rocket! Sorry to see you lost the first!